One of my GCSE Computer Science students is a keen musician and is interested in creating a guitar stomp box that you can control with your mobile phone via Bluetooth. 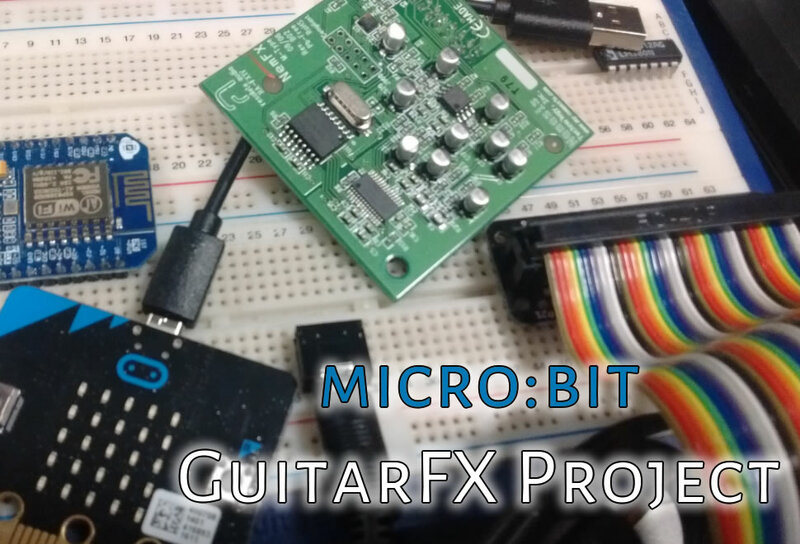 This series of blog posts will keep track of the progress we make as we attempt to use the BLE (Bluetooth Low Energy) capabilities of the BBC micro:bit to control an audio DSP (digital signal processor) to add some cool sounding effects to a guitar. Unfortunately, BLE is not enabled in micro-python as it takes up too much space to fit inside the firmware alongside the micropython runtime so we’re going to have to use ARM’s online MBED C/C++ tools. This should be a fun learning curve but will ultimately give us greater control over the features of the FX pedal project. The end result will be an android app that lets you choose different sound effects (like reverb / chorus / delay) and customise how they sound with on-screen controls. The android app will be linked via Bluetooth to a BBC micro:bit which will control a DSP board that will do the actual audio processing. The kind people at Profusion Audio Semiconductors have sent a free sample effects of their RA-FX1V effects board that should do the job nicely. Rather than completely re-invent the wheel, we’re going to use Proto Pedal Board kit from Sparkfun Electronics as the basic circuit board with bypass switch and input / output jacks. Watch this space for updates, resources and ideas as we try and get the project up and running.